Combining traditional and contemporary features into a one of a kind guitar, a well-thought-out Custom Shop Martin like this OM-42 Deep Body is a beautiful treasure and a magnificent musical instrument. Searching the world for the right guitar will turn up many instruments well worth playing. Some guitarists find examples to their liking, but wish they had a different shape to the neck, or different aesthetics and so forth. Sometimes they are lucky enough to find a dealer who has ordered a customized guitar to their liking. Others opt for ordering their own custom-made instrument, to have a go at designing a guitar, and to insure the exact specs that should meet their heart’s desire. And many like the idea of knowing such a guitar was made expressly for them alone. C.F. Martin & Co. has a long history of making customized musical instruments for discerning guitarists. For most of the company’s history they were simply referred to as special orders. Typically, a customer would write a letter to Martin with their request, and the contemporary Mr. Martin would decide to honor the request or not. Many times the answer was a polite no. Special orders at Martin became extremely rare after the Second World War, until they instigated an official Custom Shop in 1979. While the manager of the Custom Shop coordinated customer orders, the custom Martins themselves were built out on the factory floor, alongside the regular catalog models, albeit by veteran employees assigned to Custom Shop work. Martin felt it was better to keep their best craftsmen out amongst newer employees to set examples and be available to answer questions. Today, the guitar makers of Martin’s Custom Shop work in their own area apart from the main line, where they focus exclusively on custom shop orders and the making of the exacting vintage replica guitars of Martins new Authentic Series. The wait time for a custom Martin is typically quoted at about six months, but some specs, like pearl top trim or custom inlays can add many more weeks to the time. When ordering a custom Martin, one must choose an existing Martin model as a starting point, and it is wise to choose well, as each spec customized to meet the customer’s desire increases the final cost. 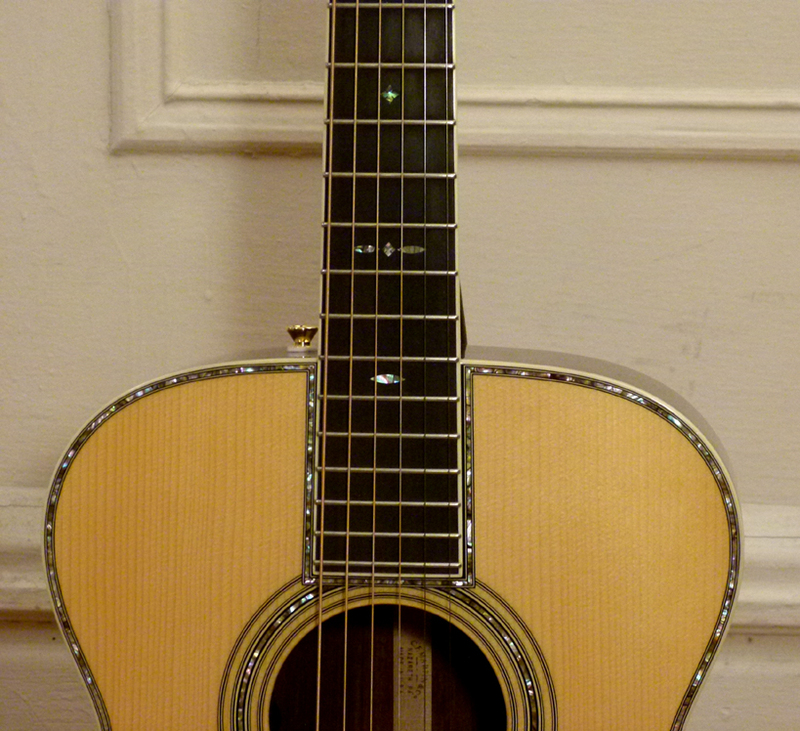 This exquisite example of Martin Custom Shop chops was based on the OM-30 Pat Donohue model. Donohue is a Grammy winning guitarist and long-time member of the house band on Public Radio’s A Prairie Home Companion. 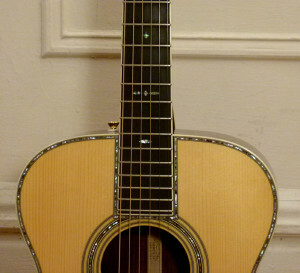 His artist signature model was the first Martin offered for sale in the deep body OM design. 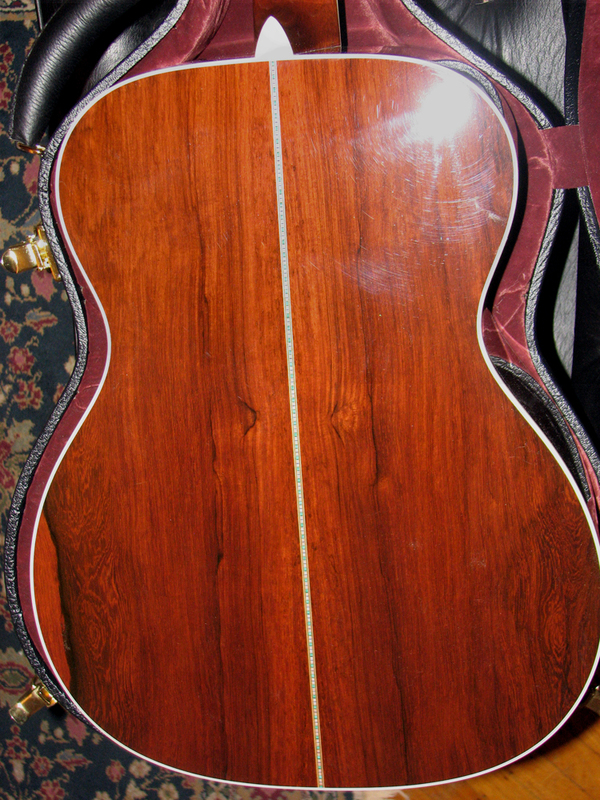 It comes standard with Indian rosewood for the back and sides and a top made from very high grade Adirondack spruce. It is also the first instrument to appear in Martin’s catalog since the early 1920s that is made in Style 30, which features high-color wood marquetry for the top trim and back stripe. For this custom shop guitar the customer took the Donohue design and re imagined it with upgrades and ergonomic features. For the back and sides, the Indian rosewood found on the Donohue has been upgraded to Madagascar rosewood. 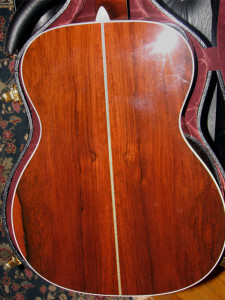 With its reddish tint, often lavish figuring, and wide-reaching tonal complexity, Madagascar rosewood has both a physical beauty and tonal properties similar to Brazilian rosewood, which was the first choice for top shelf Martins until the mid-twentieth century, when furniture makers and clear cut farming along Brazil’s coastal lowlands rendered it all but extinct. 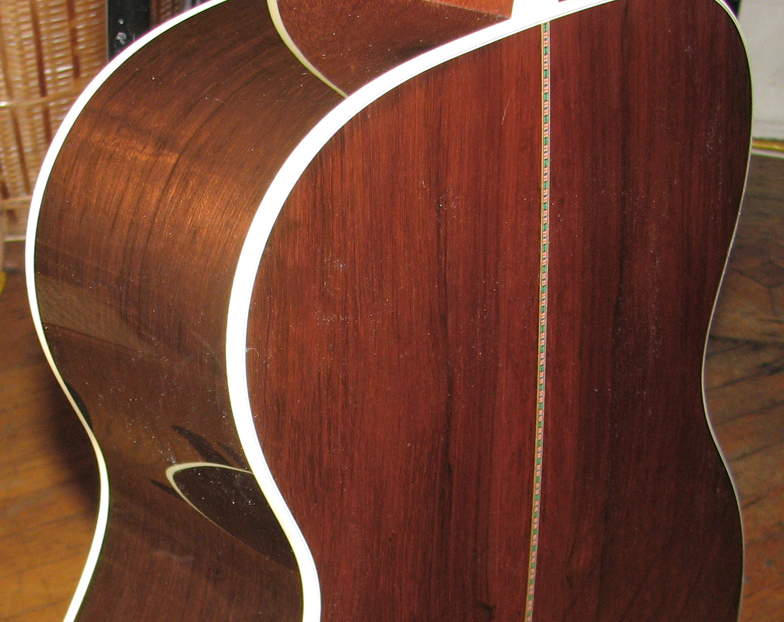 Brazilian rosewood is listed as an endangered species and its use adds thousands of dollars to the price of a guitar, as legal supplies are limited and its trade tightly controlled. It is prized for its attractive looks, but more so for the richness and complexity of its tone. Madagascar is a bit drier in tone than Brazilian, with its own high-end chime that reminds me of mahogany. But Madagascar is a true rosewood; it offers an open yet darker low-end undertone than mahogany, and it has classic rosewood complexity in terms of harmonics, which overlaps with many tonal properties heard from Brazilian. While Madagascar is often seen on guitars with wild grain patterns, this Martin has more traditional looking wood, with sides that are perfectly quartersawn with very straight grain – most Brazilian-esque. The back features straight grain as well. It has some long, bookmatched blackish lines, which are even more reminiscent of rosewood from the coastal lowlands of Brazil, while there is some tell tale feathering in the grain that gives away its origins from east of Mozambique. Eastern Red spruce, known colloquially as Adirondack spruce, was the choice at Martin until the post-war era, when wood suitable for soundboards had basically been farmed out, and it was replaced with the more plentiful and cheaper Sitka spruce from the Pacific Northwest. Today, Adirondack has returned to prominence now that sustainable forestry has allowed for trees old enough to supply top wood of the correct size and grain stiffness. And the top on this OM is a wonderful example. Like other high-end Martins made with Adirondack, this top is straight and perfectly bookmatched with sections of reddish grain lines standing out from a pure and creamy background, each corresponding to the sections of grain lines on the other side of the top. And much like Adirondack found on pre-war Martins, there is a consistent wash of fine cross grain that suddenly stands out when the light hits the spruce just right. Both the Madagascar rosewood and the Adirondack spruce were selected from the stacks at Martin by one of company’s veteran wood buyers, who has many years of previous experience working in the Custom Shop. Although Martin claims wood grading is purely cosmetic, even the lowest grade wood used to make a Martin is better than most wood found on guitars in typical musical instrument shops. This very high-grade top is noticeably stiff and reflective, so it is only in its infancy in terms of the depth and expanse of the voice and tonal pallet. Similar to the top on a Brazilian rosewood Laurence Juber model I once owned, it is almost as if any tone production skips across the surface, like a stone skipping across a lake. I can just tell how much depth, color and resonance is trapped in those extra-stiff fibers. Once this top breaks in, and strums and sustained notes set down into the spruce, it should prove to be glorious. And even in its infancy, it sounds better than it looks. Better than a great many other Martins, for that matter. Adirondack is my favored top wood to match with Madagascar rosewood, as its unique properties of focused, pristine clarity bring out the very best of that special Madagascar musical chime in the trebles, while allowing the optimum definition for increased complexity in that rosewood bottom end. From the first strum there is a stark ring to the fundamental voice, each note sounding pure but with pronounced substance, clear yet dense, like diamonds. And with each steely note ringing off a string, an expanding sonic reaction blooms from an echo beneath the top voice, and a woody hum is heard deeper down. Up top, a shining choir of lofty overtones comes to life. This guitar shows off the most sophisticated type of Madi-Adi tone. While dense and smoky underneath, some Martins with these tonewoods come off darker. While woody, some sound more old-timey. This deep body OM has a voice that glints and chimes and is more the sonic jewelry box than the old wooden sea chest. There are finely sculpted top notes, spawning rich but nicely defined sympathics that reflect from the stiff Adirondack, and as a strum completes or a chord hangs in the air, glimmering harmonics form like sprites above a storm, which I often refer to as the Adirondack angels. And that will all increase with maturity. So the dynamics are similar to that of the OM-28V and the now sadly discontinued OM-18V. It has very fat fundamentals with a lot of kick when a player digs in and plays hard. But that Madi-Adi combination allows lightly struck notes to retrain a pure top note surrounded by a host of resonant tone. It is a voice as lovely in its delicacy as it is impressive in its powerful majesty. And that is increased all the more by the special deep body configuration. 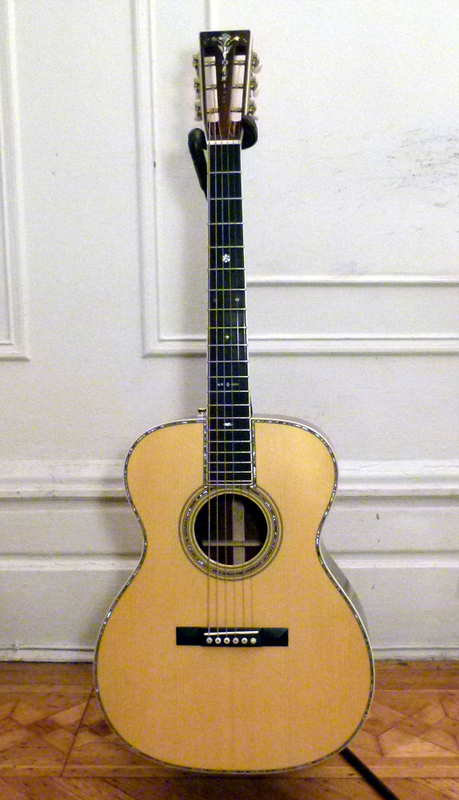 With its combination of a long-scale 14-fret neck and lightly-braced auditorium size top, the Orchestra Model design introduced in Martin’s 1930 catalog ushered in the era of modern acoustic guitars. It is considered by many to be as perfect a guitar design as yet invented. 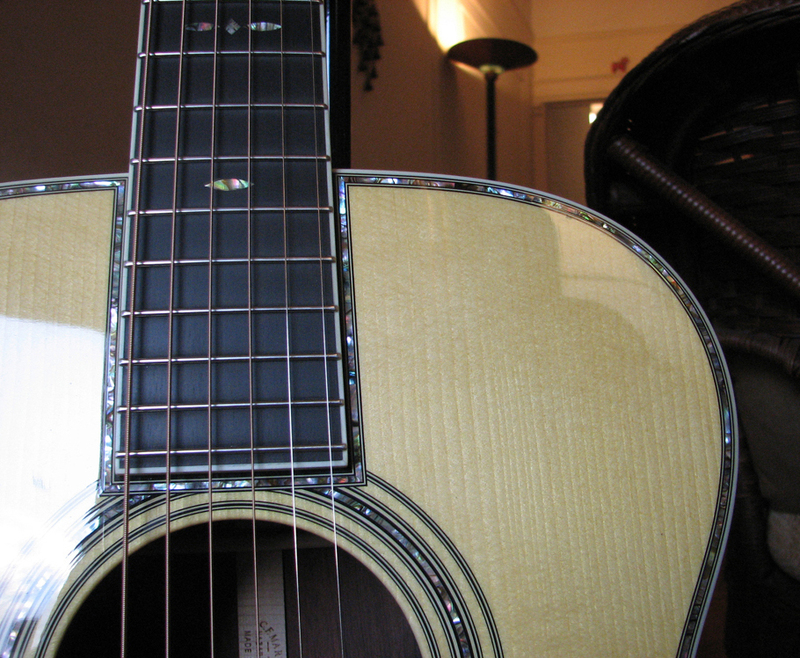 The extra string tension from the long-scale upon the relatively small soundboard, with a small maple bridgeplate and scalloped 1/4″ tone bars to increase resonance, provide the volume, sustain, string to string balance, and added projection thought ideal for playing fingerstyle guitar, which feature multiple parts played by a single guitarist. But that extra power from the long-scale neck makes OMs versatile enough to satisfy strummers and flatpickers, all from a guitar compact enough to play comfortably when seated on a living room sofa. The traditional OM has nearly perfect string to string balance. But compared to extra-large guitars like dreadnoughts and jumbos, the OM just doesn’t have throb at the very bottom some people crave. One reason for this is that the A (5th) string is actually the dominant bass string, so that low E (6th) string doesn’t swell out over the other strings the way it can in larger guitars. The solution is found in the deeper body. It increases the depth of the instrument’s sound chamber 1/2″ beyond the traditional 4-1/8”, which in turn increases the overall volume of the guitar, while it also increases the presence of the lowest lows, so they stand out when playing with other musicians, and that low E string is boosted just enough to satisfy the ear that likes the bigger bass of a dreadnought, but not its physical bulk or the shoulder strain that can come from reaching over such a large body. And yet it still sounds like an OM, only more so. This is an OM that can be turned up to 11, and it tends to cruise with a bit more horsepower. In other words, the overall voice is “bigger” than other OMs, while the extra presence in the low end is notable, but doesn’t tilt the balance of the voice out of whack the way a dreadnought does. Rather, it adds just enough to be, perhaps, the ideal non-dread for dread lovers. With clear and ringing authority, a powerful punch, stellar definition, shimmering overtones, and a resonating undertone of colorful complexity, there is an opulence and sophistication to the overall voice that seems indeed fitting for its ornate appointments. Although this guitar is a 14-fret OM, it was made with the pyramid bridge and slotted headstock traditionally found on 12-fret vintage Martins. 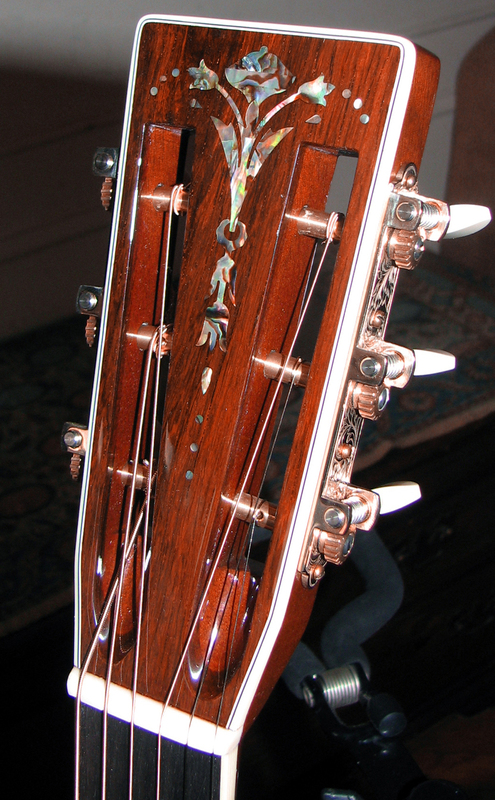 And in the center of the headstock is an exquisite torch inlay, used on only the very best Martins up through 1930. 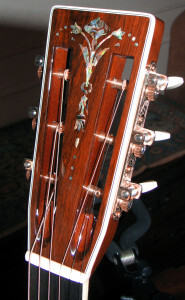 Other features inspired by old high-end Martins include high color abalone shell purfling around the top and fingerboard extension, and the sound hole rosette, as well as the ornate cats eyes, snowflakes and diamonds inlaid on the ebony fingerboard, in the Style 42 pattern established in the era of the 12-fret Martins. With the most premium woods, and the ornate inlays and top trim of shimmering abalone shell, Martins made in Style 42 were the top of the line throughout the 1800s and early 1900s. A deluxe version appeared on two 00-42s just after 1900 featuring pearl trim on the back and sides, as well as even fancier inlays. This later became known as Style 45, which remains today as the top of the line in Martin’s Standard, Vintage, Marquis and Authentic Series. Style 42 continued to be made from the best materials, but 42s cost considerably less than 45s due to the man hours involved in that extra inlay. But with the exception of a few special orders, Style 42 remained exclusive to the traditional 12-fret guitars, rather than the 14-fret designs, until it was retired with all other fancy Martins at the onset of America’s entry into the Second World War. 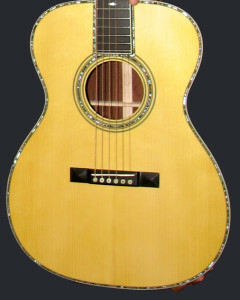 Style 45 was revived in 1968, and Style 42 followed shortly after, which allowed Martin to offer the same woods on a Style 45 guitar at a considerably lower price. While Style 45 used modern trim and large hexagon fretboard markers, Style 42 brought back the fancier trim originally used on those old top-of-the-line 12-fretters. The glint and glow of the pearl inlaid on this guitar offers every color normally seen in abalone, with greens and golds, blues and purples, reds and pinks, where many guitars only offer a couple of colors beyond the basic mirrored silver. I particularly enjoy how so much more color comes out when reflecting the full spectrum of natural sunlight. One extra-lovely touch is the fact the dot markers on the side of the ivoroid-bound neck are also made from tiny bits of abalone that add that much more glittering to the overall aesthetic. But they also serve the performing musician, as they pick up light and reflect brightly when on stage, in otherwise dim light or colored light that normally would render side dots invisible. The Pat Donohue model was made with an extra-wide 1-13/16” neck width that had a modified V profile at the back. This custom OM-42 Deep Body was ordered with the normal OM neck width of 1-3/4” and the modern low profile neck found on the Standard OM-42. It retained the Donohue’s unique Style 30 back strip, as well as its 2-5/16” string spacing at the bridge, the same spacing found on the popular OM-28V, the OM-21 Special, and new CS-OM-13. It also has a gold strap button installed on the bass-side shoulder, rather on the underside of the neck heel. 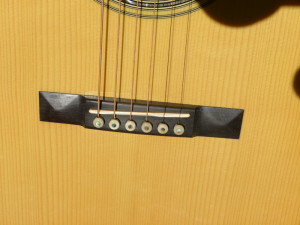 This is a common practice among professional musicians who are required to play lead guitar up in the highest frets, as it keeps the strap and button from getting in the way. And installed inside the guitar is the Fishman Matrix Infinity pickup system, which features an undersaddle pickup with discrete volume and tone controls hidden just under the lip of the sound hole for easy onstage adjustments. This OM-42 Deep Body is a showcase musical instrument with a sophisticated voice to match its luxurious appointments, combining classic looks of a Style 42 guitar from Martin’s 12-fretter era with the powerhouse playability of a 14-fret OM made in an extra-deep body of luscious Madagascar rosewood. I’ll have a deep body OM custom for my next album, very much like the 42 but without the abalone purfling. Great guitars. Greatt guitar! How does it compare tonewise to a CS OM-18 GE, which has the shallower body? The CS OM-18 is has ultra-light construction and is designed for sensitivity to nuanced playing. This guitar has more typical Martin OM construction and the same bracing as the Laurence Juber models and the now retired OM-28V, etc. It is a powerhouse that can be played at levels that would turn the CS into a rattle. And while it will never come alive to a very light touch as the CS will, it can be played with a restrained hand and light up like a Christmas tree. I love how effortlessly complex it the voice is, in that Style 42 harmonic way, while still having a spacious undertone, and how the deeper body gives it a larger, wider, deeper undertone as well. It is not as open and airy as the CS or similar guitars. It fills in the space with darker, more solid coloring.